Coloured acrylic has unique physical properties and performance characteristics. It weighs half as much as glass, and is up to 10 times more impact resistant. 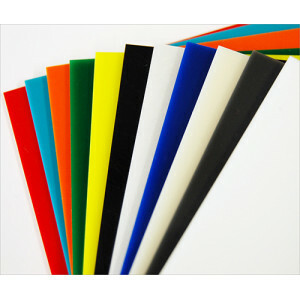 Coloured acrylic sheet has outstanding weatherability and formability, and can be formed into a variety of shapes making it ideally suitable for many end users such as illuminated signs, point of sale displays, furniture, skylights and architectural glazing and even as acrylic splashbacks in the kitchen. FREE perspex sheet cutting service**: Just tell us how you want it cut when you checkout in the special instructions box. Minimum width of cut is 75mm. Saw width is 3mm. Cut sheet size Tolerance of +/-1mm. Custom cut items are exempt from a full refund. If a return is required we will only be able to refund the closest 'stock' size, we advise that you contact us before return to determine what refund would be applicable. *Full advice on installation can be gained from our knowledgeable sales team. we cannot be held responsible for installation issues.